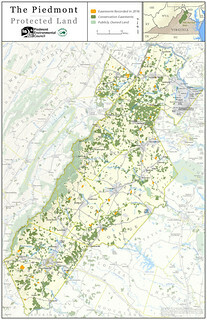 The Piedmont Environmental Council reports a combined total of 7,595 acres were protected in Albemarle, Clarke, Culpeper, Fauquier, Greene, Loudoun, Madison, Orange and Rappahannock Counties in 2016 by various land trusts and public agencies. This brings the total acreage of land under conservation easement in the nine counties to 394,963 acres. Buck’s Elbow Mountain in Albemarle County is one of the conservation highlights from this past year. The landowner, Mitch Carr, conserved 263 acres of valuable forestland. The land is also important locally because it’s the site of the 1959 Piedmont Airlines Flight 349 crash, and remnants of the fuselage remain on site. “Conserving this forested property helps contribute to water quality, as it contains streams that ultimately flow into the South Fork Rivanna Reservoir. It contains two globally-rare significant natural communities, and it has the potential for rare plants,” said Kim Biasiolli, forest conservation specialist at Virginia Department of Forestry, and who oversees the easement. Another conservation success from 2016 includes farmland with ties to the Civil War. Howard and Jane Grove conserved 181 acres of their beef cattle farm in Morrisville, Virginia through the Fauquier County Purchase of Development Rights program, which purchases easements to conserve working farms and farmland in the county. “I used the funds to buy more farmland, more family farmland, to start piecing it back together,” said Mr. Grove. The property was once known as Belvaderia Farm, dating back to pre-Civil War times, and an archaeological site has revealed remains of historic outbuildings. Also identified was an African-American cemetery, according to Ray Pickering, the Fauquier County PDR program manager. "Mr. Grove is a well-respected farmer who has implemented many conservation practices. He serves on the board of directors of John Marshall Soil and Water Conservation District, and he was past President of the Fauquier Farm Bureau,” said Pickering. 28,626 acres of Civil War battlefields. *A conservation easement is a voluntary agreement between a landowner and a land trust (such as a public agency or a non-profit conservation group like PEC) to permanently protect natural, scenic and cultural resources on their land.